Every year for the last few years, I wake up one morning and think to myself, “Oh crap, I forgot about Girl’s Day! !” I usually make a mad dash down to Shirokiya and buy a card and some mochi, slapping myself on the face for leaving my treat shopping for the last minute. I spent Sunday through Tuesday squinting one eye shut until my eye doctor gave me a temporary contact this afternoon. It feels so much better, even though it’s a soft lens. After that, I went to Marukai and loaded up on pink and purple goodies to make girly bentos with. My credit card is still sobbing in my purse. 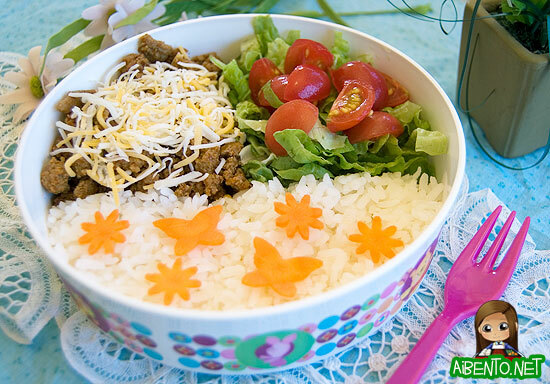 Today I’m having something completely new, a taco rice bento! I made some turkey taco rice last night for dinner and so today I packed some in a flat Winnie the Pooh tupperware container for lunch. It was extremely fast, though a bit of time should be accounted for in regards to the rice cooling off. 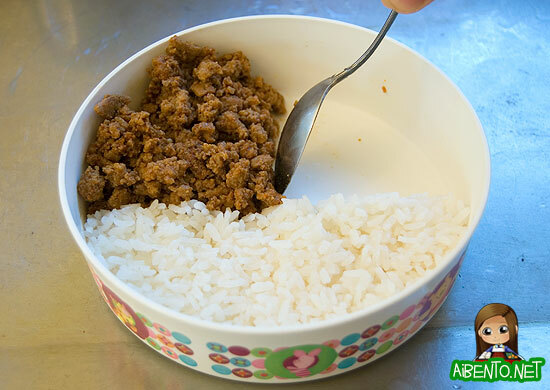 I simply added the rice and then took Baby Girl to school. When I got back, it was cooled enough to pack the rest of the ingredients. Using my baby rice paddle, I added about 1 cup of rice and flattened it out and pushed it to the side. Next, I spooned in the turkey taco meat. Using the back of my spoon, I carefully nudge the turkey meat over to one side. 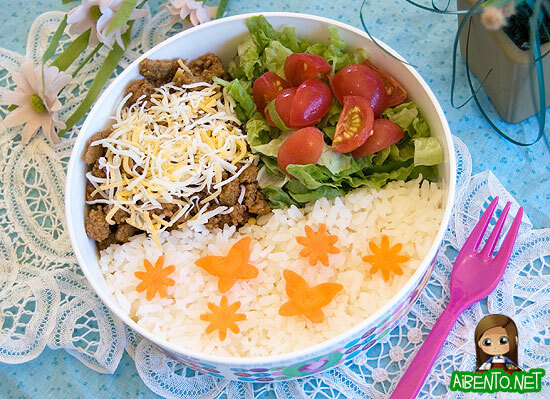 Then, I just dropped the lettuce in and topped it with tomato, then sprinkled some Mexican cheese blend on the meat. The cheese is a must! It make the dish complete! For some optional finishing touches, you can add some cute carrot cutouts. I thinly sliced a carrot and microwaved it in water in a Pyrex for about a minute and a half, then cut it with cutters. It added a nice and quick cute element to my lunch. Whee! I’ve officially passed 10 pounds lost! I’d say it’s time to celebrate, but I actually passed the milestone last Friday and believe me, I already celebrated, LOL! I’m not entirely sure why I’m still losing weight even while polishing off my Valentine’s chocolates, but I suppose it could be from increased metabolism due to the daily biking. I used to have crazy metabolism in high school and I’d always thought that besides being young, it had to do with me going and working myself haggard at aikido twice a week.